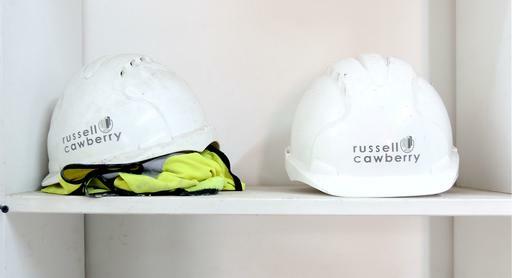 Our initiative “Think Safe, Work Safe, Stay Safe” is a prominent message across all Russell Cawberry sites, producing effective results and an exemplary health and safety record. We consistently achieve exceptional safety standards, with 0 reportable incidents over the past 8 years. We work hard to achieve and maintain high standards of health and safety, with a range of training and continuous professional development available to all staff. Our Health & Safety Manager visits all sites on a regular basis and provides proactive and continual support to site management teams, as well as monitoring the performance of our subcontract partners. Health & Safety results and statistics are reported to the Board of Directors monthly who review and set targets and objectives for the future whilst maintaining a culture from the ‘top down’ of high standards and continued support. You can view a copy of our company Health & Safety Policy which is reviewed annually and signed by our Managing Director, Pierce Ryan. This also sets out our strategy for implementation of the policy. We are accredited to CHAS, Alcumus Safe Contractor and Constructionline.